Blending the unexpected can have surprisingly awesome results: Eddie Van Halen plays a mean guitar on "Beat It", and those rims you put on your Caravan are so dope, you'll no longer have to. 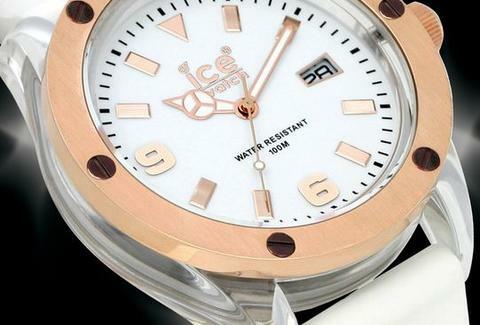 For a watch that's all about unexpected mixing of materials, check out Ice-Watch. 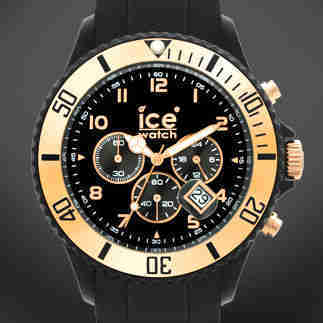 Launched in 2007 in Europe and hitting American markets, the 14-collection-strong Ice blends a Swatch-like irreverence of colors/materials (like silicon and lightweight see-through plastics) with more classic, masculine looks; they're all designed in Belgium, and powered by Japanese quartz, about which the Swiss are inwardly pissed, but outwardly neutral. "Classic" joints take an analog face, do it up in colors like green, steel blue, or black, and slap it on a clear plastic body/band, while "Sili" models have the entire watch (from face to body to band) in one solid color and rock a chunkier body and really large faces, which is pretty much what you'd expect from someone with a chunky body. "XXL"s get an extra-large face and look kinda like a ship gauge with little rivets, while "Chrono" jobs look more aeronautic with dials inside the face and a grippy silicon band, in which Bill Gates plays lead guitar, yet somehow never gets laid. If you're really feeling sassy, there's the Neon collection, which offers up classic looks in semi-transparent plastic colors like aqua, lime green, and banana yellow -- the very color you'll be applying to your Caravan, just after wrapping up the layaway on those dubs.